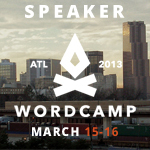 This Saturday, March 16 2013 I have the honor of speaking at WordCamp Atlanta 2013. Sweeeettt!! WordCamp Atlanta sold out early this year. And with such an awesome lineup and WordPress experts and users who will be out in full force, why wouldn’t it? WordPress is comprised of a very giving community, and I’m lucky to be part of it. To learn more about WordCamp visit http://2013.atlanta.wordcamp.org. And of course, you can use the hashtag #WCATL to follow the action.